MULTI VOLT battery and a brushless motor. 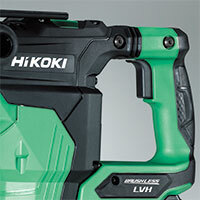 It delivers a drilling speed and demolition performance comparable to its corded counterpart. 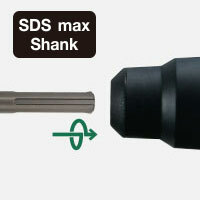 Speed of the DH40MC rotary hammer indexed at 100. When drilling a Ø25mm hole into concrete with compressive strength of 2,352N/cm2 (240kgf/cm2). When demolishing concrete with a compressive strength of 2,352N/cm2 (240kgf/cm2). Values shown are for reference purposes and may vary according to the workpiece materials and other operating conditions. exposed, the DH36DMA looks robust and sophisticated. Only one action instead of the conventional two is required to mount a bit. All that needs to be done is to insert the bit into the tool holder while turning it. 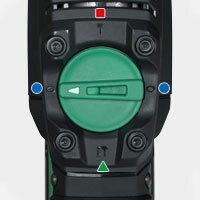 Large change lever is located on top of the tool body for easy visibility and smooth mode changing. The chisel can be rotated at 12 different angles with the change lever positioned at 'neutral'. The HiKOKI low vibration handle, which consists of the upper unit with rubber dampers and the lower unit with a hinge, reduces vibration and user fatigue, offering high productivity. Four-step impact rates between 1,420bpm and 2,860bpm can be selected by the rotation speed selector switch. 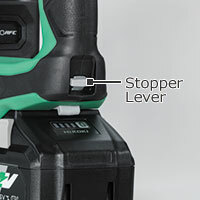 A battery stopper helps prevent the battery from accidentally falling out of the tool. The battery cannot be removed unless both the stopper and the battery latches are released. the motor's output before the entire tool jerks. specified performance. Make sure that the workpiece is placed and supported properly, and that the main unit is held firmly during operation. The vibration total values were determined according to EN60745. Supplied accessories vary by country or area.